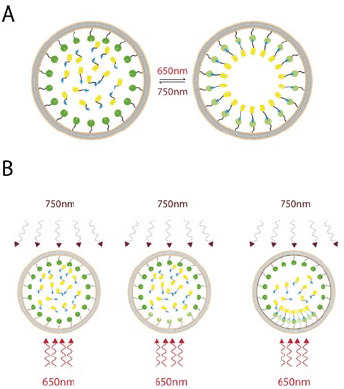 Figure 1: A) The photoreversible recruitment system consists of membrane-targeted phytochromes that are activated by red (650 nm) light and deactivated by nearinfrared (750 nm) light. Upon activation of the membrane-bound phytochrome pool, freely-diffusing YFP tagged PIF domains are quickly absorbed onto the plasma membrane. On deactivation, this pool is then released back into the cytosol. B) By shaping the spatial pattern of the red and infrared light, the distribution of active phytochrome on the membrane can be finely controlled, thus allowing for spatially targeted recruitment of the YFP-PIF to particular subcellular locations. Much has been learned about cells and their proteins using optical reporters such as GFP, but scientists want to know more. Work is now aimed at using light not only to observe cellular functions but also to control them in very precise ways. Optical manipulation of cell function is being exploited in cutting edge research to control behavior in organisms, characterize signaling pathways and test cellular network models. The approach has been dubbed "Optogenetics" and was named "Method of the Year 2010" by Nature publishing. Researchers from the University of California, San Francisco, used the phytochrome signaling network of plants to develop a genetically encoded light-controlled system for fine spatial and temporal control over proteins. The Mosaic Photostimulation System was a key part of the optical setup, allowing them to achieve tight spatial patterns of protein recruitment in mammalian cells. Phytochromes are photoreceptive signaling proteins that control many light-sensitive processes in plants by detecting red and near infrared light. The researchers optimized phytochrome B (PhyB) and phytochrome interaction factor 3 (PIF3), to produce a photosensitive pair, Phy-PIF, which binds in response to red light (650 nm) and dissociates in response to infrared light (>750 nm). When PhyB is membrane-bound, then fluorescently labelled PIF3 can be seen to translocate to the plasma membrane under 650 nm illumination, where the Phy-PIF complex forms. They tested the light-switchable protein pair by locally inducing recruitment of fluorescently-tagged Phy-PIF with a MicroPoint microscope laser system, which allowed laser illumination with near diffraction limited geometries and viewing of the laser irradiation in real time. The researchers centered continuous 20 Hz pulses of 650 nm light from a UV-pumped Rhodamine 650 nm dye cell laser at low intensity on an area of plasma membrane, while the whole cell was simultaneously exposed to inhibitory IR light from a filtered brightfield source at maximal intensity. TIRF imaging allowed them to tell if the recruited fluorophore was in the membrane rather than in the cytoplasm because it images thin cellular regions. The researchers then developed a fully automated method to expose the cell to both wavelengths of light. "The main challenge for developing the optical setup was simultaneous inverse patterns of red and infrared light," said Dr. Orion Weiner, a member of the research team. "To combat lateral diffusion of plasma-membrane bound PIF-YFP, we needed a zone of recruitment (red light) surrounded by an inverse zone of infrared light." To accomplish this researchers worked with Photonic Instruments to develop a "Complementary Mosaic Photostimulation System" that coupled the red light to the "on" state of the device's mirrors and coupled a separate infrared light source to the "off" state of the mirrors. In this configuration the device acts to both "target" activity in user-defined regions and "silence" activity outside of those regions. The Mosaic Photostimulation System contains an array of hundreds of thousands of microscopic semiconductor-based mirrors known as a Digital Micromirror Device. The hinge-mounted mirrors can be individually tilted very quickly and efficiently allowing generation of red pixels and an inverse pattern of infrared pixels at the same time. "There is no other commercial device that can generate simultaneous inverse patterns of red and infrared light," said Weiner. "This was essential for our ability to generate tight spatial patterns of protein recruitment in mammalian cells with the Phy/PIF system." Figure 2: PIF-YFP is recruited to the membrane of an NIH 3t3 cell with a box of red light and an inverse mask of infrared light. The panels on the right show translocation and release from the membrane as the red light is toggled on and off. Using the Mosaic Duet they could even project a simple pixel-based movie onto the cell membrane. TIRF imaging of the cell membrane using an Andor iXon EMCCD camera showed that the illumination pattern produced features as small as 3 μm. The iXon camera allowed them to use as little fluorescence excitation light as possible, which was desirable because the imaging wavelengths also slightly activate the photoactivatable system said Anselm Levskaya, who led the research team . The researchers could also use software to "dither" the average amount of red light in the target mask, allowing them to smoothly titrate the fraction of active Phy and recruited PIF-YFP. This showed that the technique could be used for 'grayscale' control of the chemical potential. The genetically encoded, light-switchable Phy- PIF interaction module the researchers developed had a titrated and reversible interaction and could potentially be used to control any live cell process that depends on a recruitment event. Because the light can be controlled with high spatial and temporal resolution highly complex spatial or temporal patterns can drive a process using the Phy-PIF module. The researchers are currently using the system with closed-loop control to automatically tune activation of the photo-modulated signal transduction pathway. This is important for implementing quantitative microscopy experiments with single cells, said Levskaya. They foresee the Phy-PIF module being useful for controlling a wide variety of cell biological processes without requiring case-by-case protein engineering. "I think one of the biggest applications it will have will be in perturbing gene transcription and signal transduction pathways in developing animals," said Levskaya. "Being able to alter in time and space what signals and genes are being made should allow us to perform very novel kinds of experiments during development to try to reverse engineer the machinery that establishes the animal body plan."